There was a woman who killed her ex-husband that author Judy Kirkpatrick knows. She considers the woman as a sociopath who, three years ago shot her own 36 years old son in the neck and paralyzing him for life. She was sentenced 13 to 40 years in prison, served three years and is now out pending a new trial. 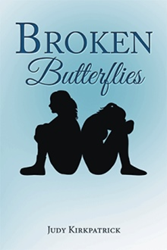 Kirkpatrick’s book “Broken Butterflies” (published by Xlibris) is based on a true story of her relationship with this woman and how she got away from her. The fictional story is about a character named Judy Kirkpatrick who met Jessica Wilson in the parking lot of her son’s elementary school. Judy was mesmerized by Jessica’s poise and beauty and they began a friendship. However, as Judy got to know Jessica better, she realized there was a sinister side of her. Eventually, Judy’s life was in danger. “It’s no big deal. A lot of people do it.” Now she was walking around the room picking things up and throwing them on the floor, as if she were looking for something. Grabbing a pair of sandals, she bent over and shoved them on her feet. I wondered why she wasn’t on Prosac or something; wasn’t there some kind of medicine for people who caused OTHER PEOPLE to be depressed? Judy Kirkpatrick studied journalism at the University of Iowa. She had written a column for a newspaper for three years and had a vivid reader following. She was a single mother for many years and raised a wonderful man who enlisted in the army and did three tours in Iraq. She loves to write since she was very small. She lives with her wonderful, supportive boyfriend, Dave who always encouraged her to keep writing even when she got discouraged.